This structure, which the archeologists call the "Western House," was located outside and to the west of the presidio and appears to be depicted on the Urrutia map. Evidence suggests that the house may have been used by French traders just after Los Adaes was officially abandoned. Excavated by Gregory in 1984, the Western House consisted of a large shallow depression measuring some 6-x-5 meters. Intermittent postholes lined the outer edge of the depression. Within the structure was a central hearth represented by a concentration of ash. At the north end of the structure were deposits of burned clay and small stones. There were also apparent postholes within and just outside the structure. The Western House is interpreted as a jacal structure with an earth floor, wattle and daub walls, and a thatched roof. The shallow depression is thought to have been caused by wear and maintaining the earthen floor. The walls would have been formed by upright poles woven together with branches filled in with stones and a coating of mud. The burned clay and deposits of small stones suggest that remnants of the structure may have burned after it was abandoned. The house depression was filled with midden debris that contained artifacts dating after 1740, such as fragments of Rouen Polychome, a tin-enameled ware made in France after 1770. Spanish documents state that three French traders and their wives remained at Los Adaes after it was abandoned in 1773. The Western House is a good candidate for a French trader's residence. 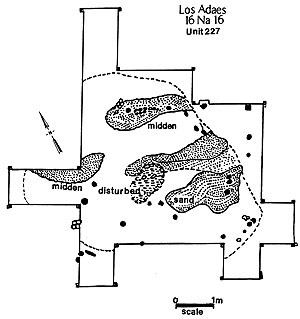 Plan of the jacal structure dubbed the "Western House" as documented by Pete Gregory in 1984. From Gregory 1985: Figure 2. 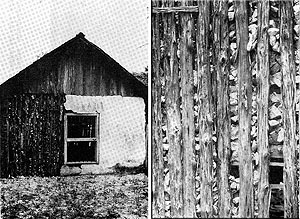 Wattle and daub construction as seen in a historic jacal house at Bracketville, Texas. The detail on the right shows how the spaces between the upright posts were filled with mud and rocks. The walls were then plastered over. This is comparable to the construction techniques that archeologists infer were used at Los Adaes. From Corbin et al. 1990. 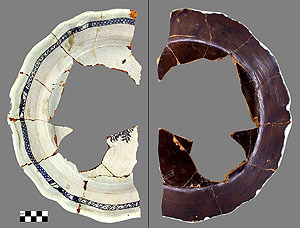 Front and back sides of a partially reconstructed Rouen Polychrome dinner platter found in the fill of the Western House at Los Adaes. This imported French tin-enameled ware was made after 1770, suggesting that the house may have been one of those occupied by three French traders and their wives who are known to have lived at Los Adaes after it was abandoned in 1773.